Few isolated incidents of long past and that too found to have been condoned due to compromising behaviour of the parties cannot constitute an act of cruelty to grant divorce, the Supreme Court observed in Suman Singh vs. Sanjay Singh. The Supreme Court, in Yeshwant Gramin Shikshan Sanstha vs. Assistant Provident Fund Commissioner, held that once an establishment is covered under any one of the excepted category under Section 16 of the Employees’ Provident Funds and Miscellaneous Provisions Act, the authorities under the Central Act cannot exercise authority over it or call upon the establishment to comply with the provisions of the Central Act. For the first time in the history of Indian Supreme Court, the Court issued warrant to a sitting High Court Judge. The Seven Judge Bench of the Supreme Court has issued a bailable warrant to Calcutta High Court Judge, Justice Karnan as he failed to appear before the Bench,hearing a suo-motu contempt proceedings against him. The Bench has posted the matter on 31st March. Supreme Court of India issued certain important guidelines to avoid the transfer of matrimonial disputes pending in Family Courts. The Bench of Justices AK Goel and UU Lalit was considering a transfer petition filed by wife seeking the transfer of divorce case filed by her husband because she cannot undertake long journey and contest the proceedings at Jabalpur by neglecting her minor child. She also alleged that she apprehends threat to her security in attending proceedings at Jabalpur. The Supreme Court, in Dr KS Palanisami vs Hindu community in general and citizens of Gobichettipalayam, observed that courts are not entitled to ignore clear words or add something of its own or dilute the meaning of any clear word used in the Will. The Supreme Court held that suspension of court work or strikes are clearly illegal and it is high time that the legal fraternity realises its duty to the society which is the foremost. The Supreme Court in KumariAchalSaxena vs. Sudhir Yadav, held that Disciplinary Committee of the State Bar Council cannot continue with the disciplinary inquiry against a lawyer after the expiry of one year from the receipt of the complaint and any order passed after it, is illegal. Refusing a student’s plea seeking transfer to another campus, the Supreme Court observed that solely because a vacancy occurs at the other campus, no right accrues in favour of a candidate who had already given the option and once a candidate chooses a campus, he/she exercises the option and is bound by it. The Supreme Court, in Competition Commission Of India vs Co-ordination Committee Of Artists And Technicians Of WB Film and television, held that, preventing channels from telecasting Mahabharat dubbed in Bengali is an ‘anti-competitive’ activity and the protection in the name of the language goes against the interest of the competition, depriving consumers of exercising their choice. Allowing the mother to meet her two children in Mangalore, a bench comprising Justice RK Agrawal and Justice AM Sapre said the mother’s role towards her child is more pivotal because she gives birth to her child and, hence, capable of giving more love, affection and good training to her child. The Supreme Court issued significant directions to tackle the pendency of cases in criminal courts. A division bench comprising Justice AK Goel and Justice UU Lalit was hearing a batch of appeals against the denial of bail pending trial/appeal where appellants have been in custody for a long period. Supreme Court on Monday issued notice to Centre and Reserve Bank of India on a batch of PILs alleging that the citizens were not being allowed to deposit old Rs 500 and Rs 1000 notes after demonetisation till March 31 as promised by Prime Minister Narendra Modi. 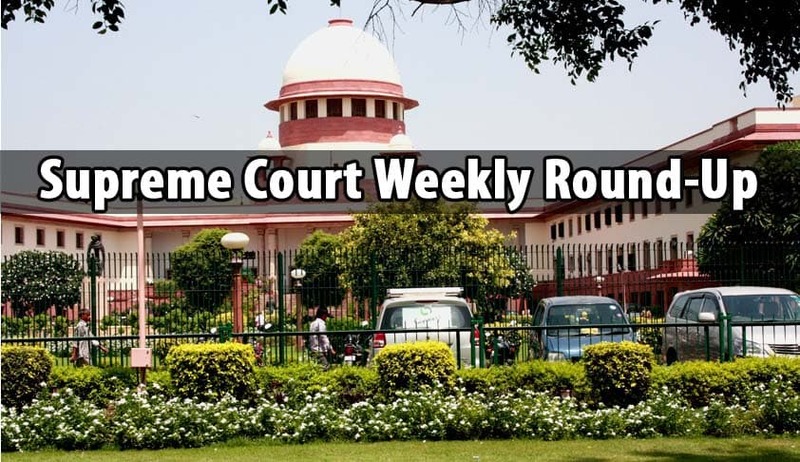 In a first of its kind, the Supreme Court bench of Justices Pinaki Chandra Ghose and Rohinton Fali Nariman, permitted on March 1 compounding of the offence of causing hurt during robbery which is punishable with life imprisonment as the maximum sentence. The Supreme Court on Tuesday directed high courts to dispose of review petitions as expeditiously as possible. The bench was considering a special leave petition challenging an order dated March 9, 2012, passed by a single judge of the High Court of Kerala in R.S.A. No.345 of 2012 and an order dated October 26, 2016, passed in review petition No.886 of 2012. The Supreme Court, in IMAX Corporation vs. M/S E-CITY Entertainment, held that Part-I of the Arbitration and Conciliation Act 1996, has no application in a case where parties chose and agreed to the arbitration being conducted outside India and the arbitration was in fact held outside India. The Supreme Court directed the Centre to respond on a PIL for alleged delay in the appointment of chairperson, vice-chairperson and other members of the National Commission for Scheduled Castes. Sending across a strong message to litigants who file frivolous and groundless petitions in courts, the Supreme Court on Monday imposed Rs. 5-lakh cost on petitioners for ‘abusing the process of law’. In a huge setback to business tycoon GopalAnsal, the Supreme Court on Thursday dismissed his plea seeking withdrawal of the February 9 order sentencing him to one year in jail and asked him to surrender on March 20 in the 1997 Uphaar Cinema fire case. The Supreme Court granted parole to Kolkata-based businessman Parasmal Lodha to participate in the last rites of his mother. Lodha was arrested in connection with the alleged illegal conversion of over Rs 25 crore in old currency for a mining baron. He was arrested by Enforcement Directorate in Mumbai. The Supreme Court on Monday transferred the matter pertaining to the suicide of an Amity Law School student SushantRohilla to the Delhi High Court noting that the HC was more equipped to hear it. The Supreme Court on Tuesday asked the Centre to file within four weeks in a sealed cover the report of the Multi Agency Investigation Team set up in April last year to probe the panama paper leak case. The Supreme on Friday refused to entertain a petition seeking direction to quash the government notification conferring Padma Vibhushan award in 2016 to late DhirubhaiAmbani, the founder of Reliance Industries Ltd. The Supreme Court which is re-examining and re-assesing the capital punishment awarded by the trial court and upheld by the Delhi High Court to the four convicts in the sensational Nirbhaya case on Monday, sought a report from the Tihar jail superintendent on their conduct of -Mukesh (24), Pawan (20), Vinay (22) and Akshay (29).